The new 3 series will debut at the Detroit auto show and go on sale shortly afterward. MUNICH - BMW will launch the sixth-generation of its 3 series simultaneously in all its world markets, the company said at a press event Friday. The sixth-generation 3 series will offer more fuel efficient versions than the current model, with fuel economy boosted by an optional eight-speed automatic transmission as an alternative to a standard six-speed unit and a new four-cylinder 2.0-liter gasoline unit, replacing the six-cylinder 3.0-liter engines on the 325i and 330i. The 3 series will arrive in showrooms on February 11 after its public debut at the Detroit auto show in January. A gasoline-electric hybrid version that uses the same drivetrain as the 5-series hybrid follows late 2012. BMW said the United States will be the biggest single market for the new 3 series, accounting for an expected 24 percent of sales, followed by China (22 percent), the UK (16 percent) and Germany (10 percent). The car will be built in Germany, South Africa and China. 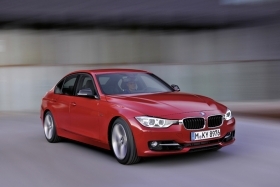 IHS Automotive expects global sales of the 3 series to increase by 22 percent to 448,600 cars next year. BMW said the 3 series will be the first premium midrange car to offer optional headup display. The new 3 series is 93mm longer than the current car with a 50mm longer wheelbase, boosting interior space with load capacity increased by 20 liters to 480 liters. BMW has sold around 2.8 million 3-series cars since the outgoing version premiered in March 2005, bringing the overall total sales of the model to over 12 million since the very first 3 series hit markets in 1975. "That makes the BMW 3 series the world's most successful premium vehicle," CEO Norbert Reithofer said in a statement. The 3 series is BMW's best-selling model, accounting for one in five of the carmaker's unit sales, said Ian Robertson, BMW sales and marketing chief. "It is our brand ambassador, the heart of the BMW brand," he said. The company invested more than 1 billion euros ($1.4 billion) in its German plants in Munich and Regensburg, as well as its South African factory in Rosslyn, to retool production ahead of the launch. The 320d diesel sedan will start at 35,350 euros in Germany, slightly more than the current model, while the 335i gasoline model will be priced at 43,600 euros.